Unlike many other VA facilities, the Ralph H. Johnson VA Medical Center hadn’t previously produced an Annual Report. I suggested that as part of our larger myVA marketing campaign we should produce one. We needed a way to showcase each of the Veteran stories to be featured throughout the entire campaign. This project required close collaboration among all members of the team, particularly between the photographer and I as we planned photo shoots based on my intended layouts. The Fiscal Year 2014 Annual Report for the Ralph H. Johnson VAMC is a departure from more traditional, stodgy annual reports. This 28-page, full-color glossy publication used a unique size and flood varnish for the cover to stand out among other facilities’ reports as well as other publications available within the medical center’s clinics. 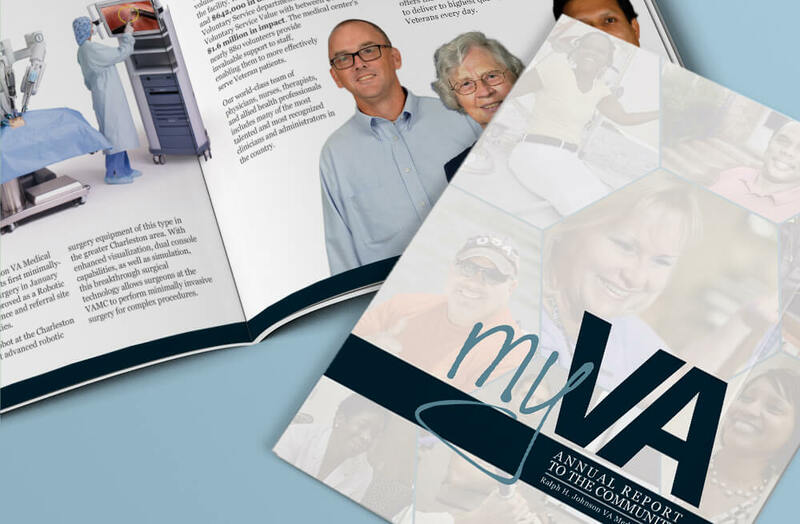 3,000 copies were produced for distribution in clinics, sent to key stakeholders and VA leadership and used in conjunction with the facility pocket folder for outreach and promotion. This project was an incredible success. It received the first place 2015 Special Publication Award from the VA Office of Public and Intergovernmental Affairs. It was also highly praised by Secretary McDonald, Deputy Secretary Gibson and the VA’s Chief Veteran Experience Manager among others. The project also set the bar for future publications I produce.